Madras: Shrimathi Devkunvar Nanalal Bhatt (SDNB) Vaishnav College for Women, an autonomous college affiliated to University of Madras has been re-accredited with A+ grade by NAAC in January 2017. The college is collaborating with Tata Consultancy Services (TCS) in the Academic Interface Program (AIP) – an initiative of TCS in offering employment oriented education to the students. 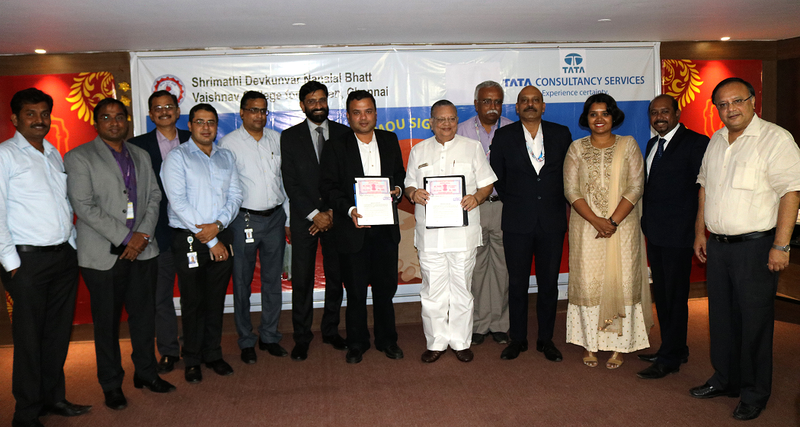 Mr. Chandrakant M. Tolia, College Secretary and Mr. Rajiv Noronha, Vice President, TCS, BPS signed a Memorandum of Understanding today that will strengthen the Industry-Institute relationship and is focussed on “Campus to Corporate Transition”, by grooming the students for the corporate world.